I Love You More Than Carrots: Anonymous David Yurman. in the same household has me. Hmm. I wonder who it could be? Or the generosity of my darling Husband. So Hubs, this post is for you. as long as it comes with a little David for moi. ahhh, that's GORGEOUS!!!!! good job to your hubs! Sorry, I'm still wiping the drool off my keyboard! That is a beautiful ring! Love it! BEAUTIFUL!! I love love DY. I got myself a confetti ring for my birthday this year and I love it. LOL!!! What a brat :o) Love the ring though !! Gorgeous!! I have a similar one and I love to wear it!! Oh my gosh... I love that ring! :) So fabulous! How beautiful! I love it!! 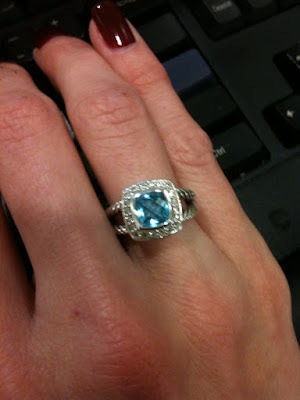 That is one gorgeous ring!! Lucky girl. ah, you got it, yay!! sooo pretty! That's gorgeous! Your hubby did good! omg! i looove loove it! its soo gorgeous!! ahhh, so gorgeous!!! this is EXACTLY the ring I'm wanting! I have a citrine DY, but I'm dying for this one! LOVE it! Our Little Christmas History, in Photos! Has Anyone Seen My Sheepie? Now You Can Have a Wishes Ornament, Too!